The Restaurant Sternen Grill is great because you get a good meal in the middle of Zurich in a very unpretentious atmosphere. The only downside is that you can’t book a table in advance but it is really ‘first come, first serve’. 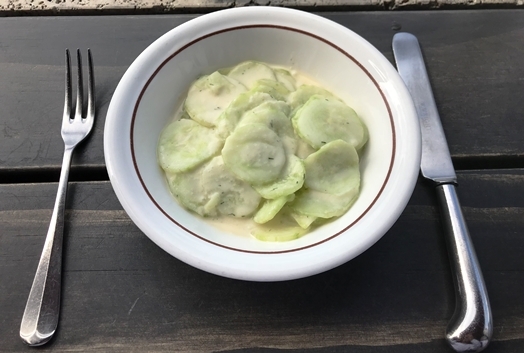 The “cucumber salad with sour cream and dill” (CHF 8.50) which I had as a starter is a generous portion and quite tasty overall. 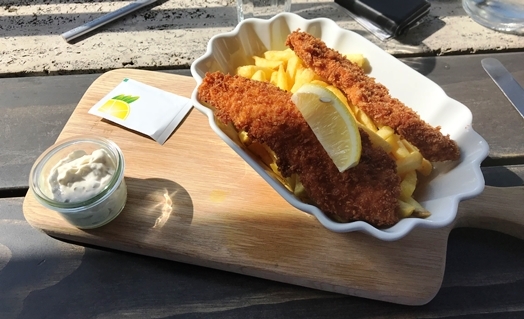 The “fish & chips (Swiss white fish crisps with home-made tartare sauce and French fries)” (CHF 28.00) are really just two huge pieces of breaded and fried fish but that has the one advantage that you actually get more fish than breaded crisps. So, it is a portion where you can really say you’ve had enough. The “spinach” (CHF 6.50) was really too much in the end – but it was quite delicious overall. If you are quick enough you get to sit on the tiny terrace with a view onto Zurich and especially Bellevue – great for making time go by quickly. The service is friendly and swift and really tries to make your stay very comfortable and they succeed.